Every weekend, the center of political power in South Carolina shifts to a tiny kitchen table on Sullivans Island. With its four wooden bar stools, table-top range, newspapers strewn everywhere and drawers full of silverware and cooking utensils, this table gives a whole new meaning to the term "cabinet decisions." That's because the man seated at the end of the table is none other than Marshall Clement Sanford Jr., who, in addition to being the favorite "surfer dude" son of Sullivans Island, also happens to be the 115th governor of the state of South Carolina. Munching on some leftovers and wearing his typical weekend uniform - cut off sweat pants and a T-shirt that reads, "If you're not a chiropractor, get off my back" - this morning finds Sanford completely immersed in the business section of the local newspaper. As he thumbs deliberately through the pages, Sanford's wife, Jenny, the couple's four young boys and the family's black Labrador retriever, Jet, suddenly shoot up the stairway from the unfinished first floor that until recently served as his campaign headquarters. Before long, the quiet solitude of another gorgeous Lowcountry morning is replaced by a brisk hum of activity as the Sanford clan plots their upcoming day. "This is a magical place to raise kids," Sanford noted, as Marshall, 10, Landon 9, Bolton, 6, Blake, 4, and Jet, a precocious eight months, gather around the table and begin vying for their daddy's attention. "They run like banshees out on the beach," he explained. "Jenny made it clear that, if we went to Columbia, we were keeping this house and coming back for the summers." Though they may live in the governor's mansion in Columbia, this modest, ocean-front house on Sullivans Island will always be home to Mark and Jenny Sanford. He still rides his bike on the island, takes long jogs on the beach and windsurfs in the waters offshore. She still picks up groceries and drops off movies at the Blockbuster Video in Mount Pleasant. Both Sanfords see their roots in East Cooper growing stronger - even as they take up residence in Columbia. "We lived downtown on Wentworth Street for a while," Sanford said. "I was commuting from Washington, D.C., while I was in Congress, and Jenny was trying to raise these four little boys all by herself. There just wasn't enough room. They couldn't play in the street downtown and she was like, 'You're not here to help out.'" Tall, tan and attractive, Sanford's emergence as the dominant force in South Carolina politics has been as swift as it has been unexpected. Eight years ago he was a complete unknown, a businessman frustrated by the inefficiencies of government who decided to run for Congress. Elected in November 1994 at the ripe old age of 34, Sanford immediately built a reputation as a maverick - casting numerous "lonely votes" in Washington in an effort to control government spending and protect Social Security. National advocacy groups such as Citizens Against Government Waste and the National Taxpayers' Union rated him #1 in the entire U.S. Congress for his votes to limit federal spending and taxes, and the ever-frugal Sanford made headlines by sleeping on a futon in his office and returning roughly $1.5 million from his office budget to the U.S. Treasury. 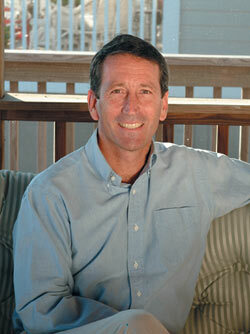 In 1996 and 1998, Sanford cruised to re-election with the highest victory margins in the entire country. In 2000, he would have been a lock for a fourth term had he decided to run. Instead, he kept his promise to serve just three terms, coming home to Sullivans Island for what he thought would be a retirement from politics and a return to the business arena. It would prove to be a short-lived retirement. Early in 2001, Anderson, S.C., businessman John Rainey invited Sanford to join him for a lunch that would ultimately change the course of South Carolina politics. Unimpressed with a field of Republican candidates that included three sitting statewide officeholders and a state senator, Rainey told Sanford he was the only candidate capable of defeating incumbent Gov. Jim Hodges in the 2002 election. Somewhat reluctantly, Sanford started what he calls "a process of due diligence." "He told me that he had followed my career and was impressed with my voting record," Sanford said of his conversation with Rainey. "He told me he thought I approached politics differently than most people and that I ought to run for governor." Still skeptical, Sanford decided to take a look at the idea. "I started doing some homework," Sanford said. "I asked myself if there was a reason to run and started looking at what was out there in terms of having realistic prospects." After pummeling sitting Lt. Gov. Bob Peeler to capture the Republican nomination in June, Sanford withstood a furious barrage of negative ads from Hodges en route to a comfortable 53 percent to 47 percent victory in November. With the win, Sanford became the first governor from the Lowcountry since Jim Edwards, a Mount Pleasant native who held the office from 1975 to 1979. Sanford's Lowcountry roots, which extend to his family's plantation in Beaufort, S.C., played a surprisingly prominent role in his gubernatorial campaign. Although he never unveiled a specific set of environmental or land-use proposals, he successfully tied each of his economic, education and government restructuring proposals under a broad "quality of life" umbrella, employing a distinctly non-Republican strategy that attracted hordes of moderate and independent swing voters. As he stated numerous times during the campaign, however, Sanford's reason for pushing the quality of life theme was more personal than political. 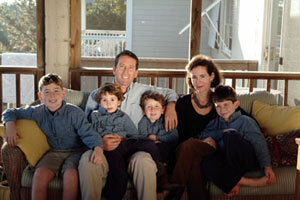 "My four boys are going to grow up in this state," Sanford said. "I think there are some things we can do today that are consistent with market principles and private property rights that could have a real difference in the way this state looks and feels 30 years from now." To East Cooper residents, that's a welcome focus from any governor. The fact that it comes from their "governor next door" makes it all the better.